We had to wait three years for a new 88 release when they signed to Island records, but now that they've gone independent again we've been treated a new disc and now a new EP within little over a year's time. This EP consists of songs they recorded just before their Island adventure, and the title track appeared on their Island release Not Only...But Also. The original version here, though, is much better (and is the same that was heard on the TV show How I Met Your Mother). It's one of their best ballads, and was one of the few things really good from the Island record. But the allure here is the four new tracks. The best of the batch is "If Anyone Should Call", maybe their catchiest track since Over & Over's "Hide Another Mistake". 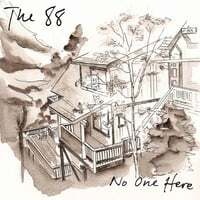 Mixing Adam Merrin's piano and Keith Slettedahl's guitar and vocals in service of a hook-filled tune is what The 88 are all about it, and this song does it just right. "Think You Broke My Heart" is another vintage 88 track with a bit of a soulful feel, and "I've Got a Name" is a fine torch song ballad. One of 2010's best EPs to date.